إن فندق ريست بوينت بموقعه الممتاز في هذه المنطقة السياحية هو نقطة انطلاق جيدة لنزهاتك في هذه المدينة المذهلة. يقع الفندق على بعد 5. Km من مركز المدينة، ويؤمن الوصول إلى أهم مراكز المدينة. يقع هذا الفندق الحديث على مسافة قريبة من المعالم السياحية الشهيرة. إن حسن الضيافة والخدمات الراقية التي تعرف بها Federal Group تغني تجربتك في ريست بوينت. إن خدمة الغرف على مدار الساعة, واي فاي مجاني في جميع الغرف, أمن على مدار 24 ساعة, خدمة التنظيف يوميًا, متجر هدايا/تذكارات هي جزء فقط من الخدمات التي تميز ريست بوينت عن باقي الفنادق في المدينة. تنعكس أجواء ريست بوينت في غرف الضيوف.تلفزيون بشاشة مسطحة, اتصال لاسلكي بالإنترنت, اتصال لاسلكي بشبكة الإنترنت (مجاني), غرف لغير المدخنين, مكيف هواء هي بعض الميزات الموجود في العديد من الغرف. يقدم الفندق مجموعة رائعة من الخدمات كمثل مركز للياقة البدنية, حمام سباحة داخلي, حديقة، لجعل إقامتك تجربة لا تنسى. مهما كانت دواعي سفرك فإن ريست بوينت هو خيار ممتاز لإقامتك في المدينة. Nice view, good location, okay breakfast. There were not much dining places and they close really early. Lucky we found the Chinese restaurant in the casino that closes a bit later. The service was excellent and the dishes were fairly priced. All rooms with nice water view. When we drove there at the front of hotel, no one help to off-load our luggage. Definitely those guys saw us, maybe racism! When I asked the staff at check in counter about parking in the street, he just said he didn’t know since it was a public road. And told me to read signs carefully. So rude! Booked a water edge room but got upgraded to one of the newly renovated tower rooms and one facing the water - amazing view to look at and the windows open up to it all throughout the room. People not exactly child friendly being a casino but the facilities included a toddle paddling pool which was great! Tower Room Highly recommended. Great buffet breakfast in a large room overlooking the river and yacht marina. Our room had harbour views South and we could have just stayed in the room watching the light change over the water and hills. 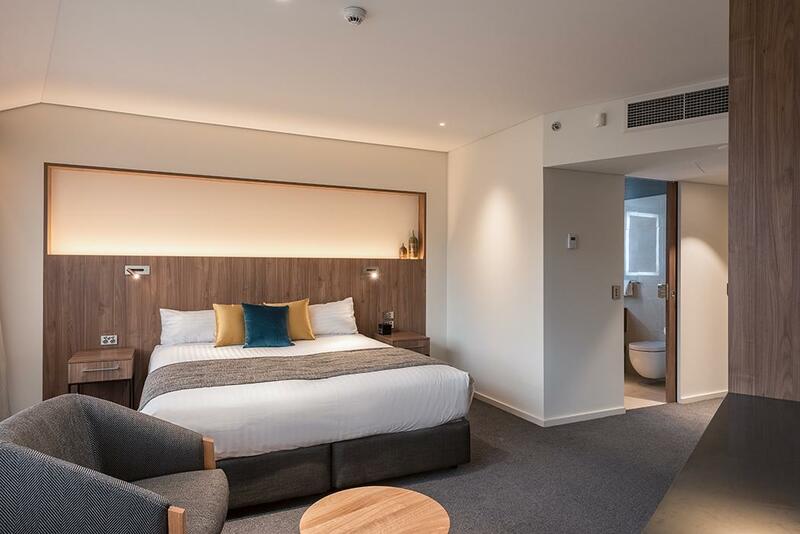 Makes a great change compared with a city hotel and only a healthy walk from Battery Point & Salamanca Market. Fantastic apartment but we paid for it. Not cheap but was very good. You get what you pay for. Bit disappointing the valet service is not what it use to be but it has been a few years between visits. Also no assistance was forthcoming even though I had an obvious disability and was struggling with the suitcase/baggage and walking stick, I guess times have changed. One of our members went to the restaurant for the breakfast at 7:30am, nobody served her. She thought that she could sit anywhere she liked. When all our members arrived, we started our breakfast. Suddenly, the waiter, Ashraf, came to ask us to leave because the table had been reserved. However, no “reserved” card was put on the table. We thought that it was unreasonable so we did not move. Some time later he came again to insist that we had to move to another table. As we continued having our breakfast, he came over again and he said, “I want this table now.” So we had to move to another table extremely reluctantly. Later, a couple sat at our previous table. One of our members went to talk to the couple and found that they did reserve a table but not a particular one. It meant that the table had not been reserved and we should not be asked to leave immediately. Actually he could find another table for them. We were so unhappy that we wanted to talk to the manager of the restaurant, the waiter said the manager would come back at 8:30 but 15 minutes later he told us the manager would not come back until 10:00. So we went to the lobby to talk to the supervisor. He wrote down all the details. As staying in a 4-star hotel, we did not expect to be treated like that and we have never been treated like that in many other hotels in the world. It was ridiculous. We are very disappointed and we hope that the service in the hotel can be improved in the future. A bad experience in the hotel. One of our members went to the restaurant for the breakfast at 7:30am, nobody served her. She thought that she could sit anywhere she liked. When all our members arrived, we started our breakfast. Suddenly, the waiter, Ashraf, came to ask us to leave because the table had been reserved. However, no “reserved” card was put on the table. We thought that it was unreasonable so we did not move. Some time later he came again to insist that we had to move to another table. As we continued having our breakfast, he came over again and he said, “I want this table now.” So we had to move to another table extremely reluctantly. Later, a couple sat at our previous table. One of our members went to talk to the couple and found that they did reserve a table but not a particular one. It meant that the table had not been reserved and we should not be asked to leave immediately. Actually he could find another table for them. We were so unhappy that we wanted to talk to the manager of the restaurant, the waiter said the manager would come back at 8:30 but 15 minutes later he told us the manager would not come back until 10:00. So we went to the lobby to talk to the supervisor, John. He wrote down all the details for us and promised to send the complaint to the restaurant manager. As staying in a 4-star hotel, we did not expect to be treated like that and we have never been treated like that in many other hotels in the world. It was ridiculous. We are very disappointed and we hope that the service in your hotel can be improved in the future. Kids loved the heated pool. Good for having a relaxed time at Wrest Point. Plenty of options for food. There are restaurants, shops and supermarkets(Coles, Woolworths) in 10 minutes walking distance. Beautiful mountain and ocean view. Bit outdated but they are working for updating at the moment after 45 years anniversary of the accommodation. Staff are helpful. We stayed in both the newer high rise and the older riverside part on this trip and apart from a bit of a rabbit warren to get to the riverside rooms they were similar in size and features inside. the riverside room feels more connected to the water and closer to the parking area and was significantly cheaper. There is a good laundry down stairs on the way to the riverside rooms. Décor is a little dated, but otherwise the hotel is very comfortable. Staff were very helpful and friendly. We stayed in a mountain view room on the 9th floor and were very happy with the view of both the mountain and boats on the bay. Didn't try any of the restaurants, bars or gambling in the casino, but enjoyed the super comfy beds. Nice service (help you to take the luggage from the car), free car parking, daily cleaning, historical decoration, easy to spot, nice view. Suggest not to try the buffect there.... not in a good quality. And quite unforgettable memory that me and my friends had experienced fire drills in the early morning during the stay (ran from 9th floor with pajamas in cold morning). When we arrived at wrest point, we were not aware that there will be a Casino below the hotel, which some people might not like. It is not so close to the city centre so not recommended if you do not drive, (or youwill have to take the bus. 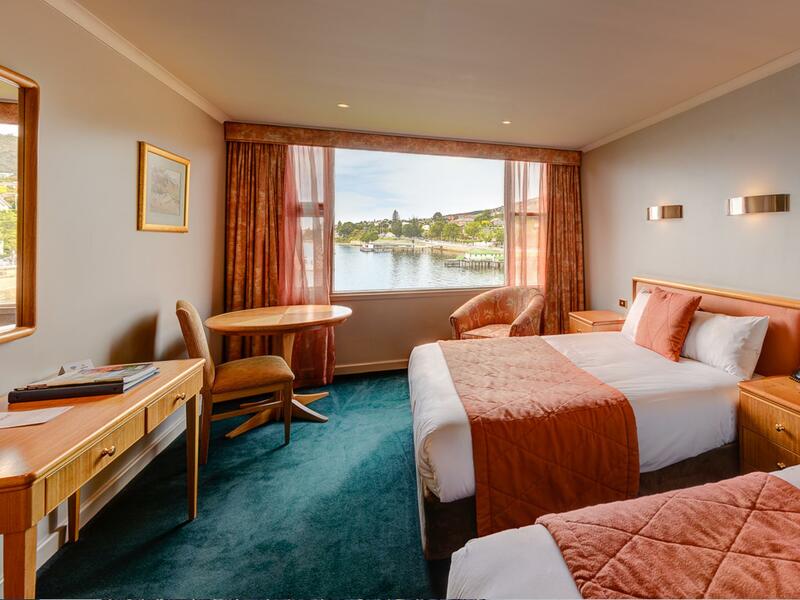 The Wrest Point Hotel is located above the Casino, so if you are into gambling it is a good choice. It is 25 minutes walking distance from the city, and a taxi costs less than 10$. The rooms are big, nice and warm. The staff is friendly, the food is good and the price is great. There is a nice gym at the hotel which is good as well. We chose this hotel for its location and had fabulous service from the moment we arrived in our taxi to checking out the next day, despite having read some reviews to the contrary. We were in Rm 914, a Mountain View Room in the Tower and although the hotel may be 40+ years old we believe they've done a pretty good job of updating and modernising the rooms to an excellent standard (for its age). Everything worked in our room, nothing was broken or chipped and all was neat & tidy. We had a super comfy bed, the bathroom was neat, clean & functional but the curved shower, while okay for my shorter stature was not very practical for my 6'4" husband to use comfortably. 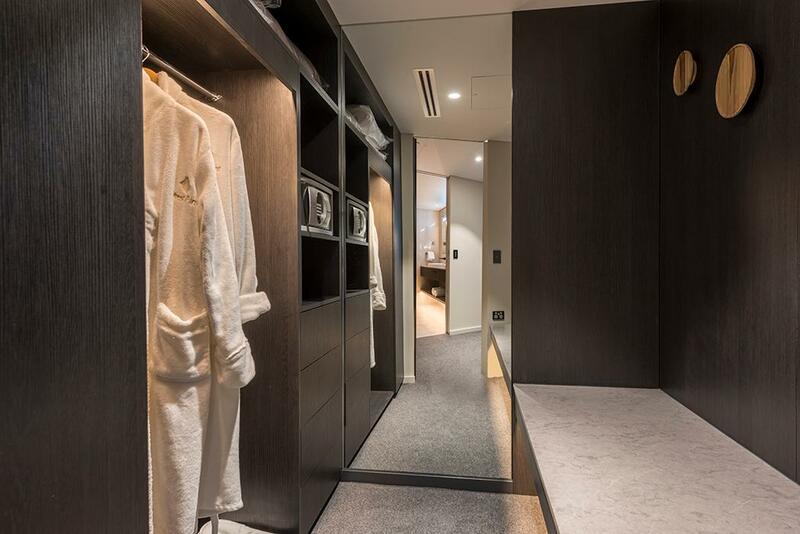 The minibar was good and service for what was unavailable in it was very quick and friendly. Peter Iles from Gaia Hairdressing on the Mezzanine floor did a great job of an up-do for me for the event we were attending in the Plenary Hall and Tasman Room. We were too late for breakfast the next morning but during the Friday afternoon had the most delicious gourmet pizza EVER in the Onyx Bar, where the staff were great to chat to. Pork Belly and caramelised onion - YUM! The trip from the airport to the hotel cost about $50, which was quicker and cheaper for the two of us than the shuttle service at $30pp. Brilliant...we loved the ocean view from our room. The car parking was free and also the Internet. We had the paper delivered to our room for free and the staff were great. There was plenty to do because of the casino and many restaurants to eat at. Convenient for guests who drive there, ample parking spaces, on waterfront, great views from rooms, spacious and clean rooms, choices of restaurants, casinos. We booked into one harbour view room and one mountain view room so that our group could see both types of views. We were assigned with the rooms on the 6th floor, which is already high enough for enjoying an unblocked view from the windows. The view from the mountain view room was just picturesque. That room was perhaps at the line demarcating mountain view rooms from harbour view rooms. 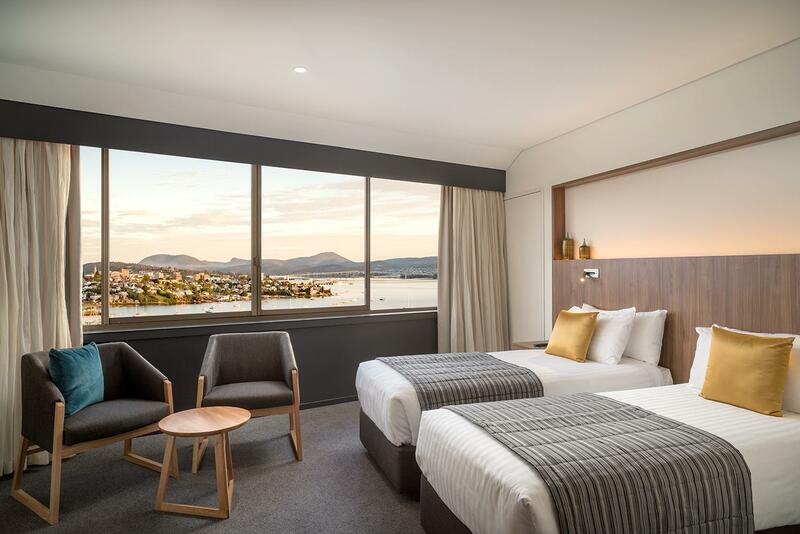 Although the harbour view room was more expensive than the mountain view one, the view from the latter was much better and more interesting as we could see the stunning view of the harbour, the mountain, Hobart city at a distance, the roads and the houses built on the slopes of the mountain. The view from a harbour view room, from which a harbour could barely be seen, was in fact a view of a very wide river estuary (or the sea) and distant houses on the opposite shore, which was comparatively plain. 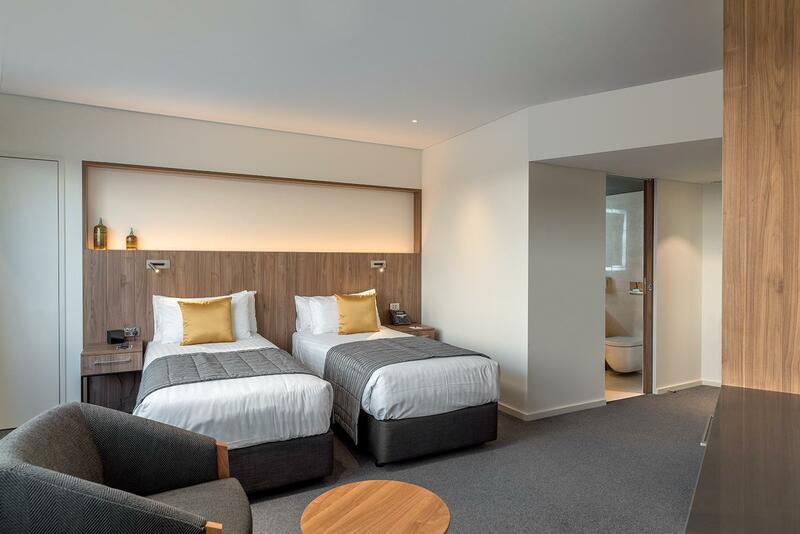 Wrest Point Hotel is a good choice if you are looking for an exquisite view from your room, convenient parking, good restaurants near the hotel and some nightlife in a casino. A great shame was that the windows of the rooms were not very clean.